Holocaust survivor Raphael Lemkin coined the word ‘genocide’ and helped establish the term in international law. Shocked and saddened by massacres throughout history, as well as the murder of his family by the Nazis, he longed for accountability for deplorable acts committed by countries within their own borders, campaigning tirelessly to reach his goal. We must shorten the distance between the heart and the deed. To live an idea, not only to talk about it or feel it. Raphael Lemkin was born on 24 June 1900 to a Polish Jewish family in the small village of Bezwodne, close to the city of Vawkavysk, which was then part of the Russian Empire and is today in Belarus. His father was a farmer and his mother a painter, linguist and student of philosophy. It was through her that he developed his passion for the past that would shape the whole course of his life. The first murmurs of the legacy Raphael Lemkin would later leave imprinted in international law began in 1913. At the age of 12, he was reading Henryk Sienkiewicz’s Quo Vadis?, a book which delves into massacres of Christian converts in the first century by the Roman emperor Nero. He questioned his mother about why people stood by and let him feed these Christians to the lions simply because of who they were. She insisted to her son that once the state wanted to eliminate a group from its lands, its citizens became the ‘accomplices and not the guardians of human life’. Sienkiewicz and Lemkin’s mother initiated his life-long obsession with trying to understand mass slaughter, whether at the hands of Nero, on the dusty plains of the Syrian Desert or in gas chambers of Nazi Europe. By the time Raphael reached his 20s he was fluent in seven languages and it was this keen interest in linguistics that saw him enlist at the University of Lvov to study philology – the evolution of language. Yet, just one year into this course, after hearing of the assassination of the Ottoman leader Talaat Pasha in Berlin, he dropped out. Pasha was a perpetrator of the atrocities against the Armenians – he ordered the arrest and deportation of Armenian intellectuals in Constantinople on 24 April 1915 and created a temporary law authorising the deportation of Armenians to Syria. He was responsible for exterminating hundreds of thousands of people yet had managed to escape the Ottoman Empire for Berlin when defeat by the British in World War One seemed certain. While in exile he was sentenced to death in absentia by the Turkish courts, and was assassinated by the Armenian vigilante Soghomon Tehlirian, whose entire family was murdered during the atrocities. The news of the assassination brought Lemkin back to his curiosity with mass slaughter. He questioned the legal nature of a crime that sees a man kill millions, acting with impunity within his state’s borders. He transferred to Lvov’s law school, later graduating to find work as a prosecutor. Beginning in 1929, he spent his spare time drafting international law that would see governments across the world commit to tackling instances of attempted annihilation of people based upon their religious beliefs, nationality or ethnic group. His ideas were first presented to his European legal colleagues in Madrid in 1933 as an essay entitled Crime of Barbarity. He defined barbarity as the ‘premeditated destruction of national, racial, religious and social collectivities’, based upon the events in Armenia, and insisted this must be illegal in international law. Among the isolationist climate of interwar Europe, these ideas fell on deaf ears. A year later, Lemkin, as a result of his outspoken concerns and criticisms of Hitler and Nazi Germany, was pressured to resign as deputy public prosecutor. Poland’s Foreign Minister Józef Beck claimed Lemkin was ‘insulting our German friends’ at a time when the country was trying to build relations with its neighbour. Lemkin was, however, not discouraged by these setbacks and instead dedicated himself to spreading his message to law conferences throughout Europe. With the outbreak of World War II, his argument would only become more pertinent. Poland was invaded by Nazi Germany in September 1939. Lemkin left Warsaw on a train immediately but did not make it far before the locomotive was bombed, leaving him to continue his escape through rural Poland accompanied by others fleeing. Ducking between Nazi bombing runs and duping Soviet soldiers into thinking he was a member of the proletariat, Lemkin made his way to a small Jewish town in the province of Wolynia. From there, he was able to get a Soviet train east to his parent’s home for what would be their final encounter. His mother, father and brother refused the life of a refugee, electing instead to stay in their warm home as long as they could, with its beds and stores of food. Lemkin said his goodbyes and travelled on to Sweden via Lithuania. His passage to Sweden was granted thanks to a plea for refuge to the country’s minister for justice. He arrived in Stockholm in February 1940. Lemkin immediately dedicated his time to learning Swedish and, after only five months, began lecturing in the local tongue on international law at the University of Stockholm. But he wanted to reach the United States, putting thousands of miles of clear ocean between himself and the growing sphere of Nazi destruction. Yet he remained hemmed in between Germany and Russia. Having secured an appointment at Duke University in North Carolina, Lemkin travelled through Russia and across the Pacific, finally reaching sanctuary when his boat docked in Seattle, Washington on 18 April 1941. 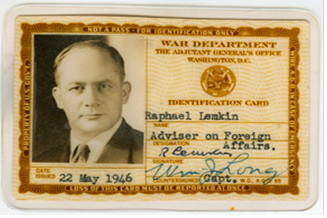 Taking up his post at Duke University, Lemkin was immediately made to feel welcome and grew accustomed to life in the US. People were fascinated by his first-hand experience of wartime Europe, and he used this intrigue to tell many audiences of the threat the Nazis posed to civilisation. His parents heard the good news of his safe arrival to the US and in June 1941 Lemkin received the final words from his parents. Written on scrap paper it said: ‘We are well and happy that the letter will find you in America’. The worn letter and seemingly misleading words read more like a goodbye than a message of reassurance. His parents were murdered at Treblinka at the end of 1942. Speaking of the trauma of these days, he said: ‘In North Carolina, a man is not fully dressed unless he wears a smile. I started to smile again, but the world lost its colour for me for many months’. Only his brother, his brother’s wife and their two children survived the war years. At least 49 other family members perished. In 1942 Lemkin found work with the US government and he continued to lobby politicians to take action against the Nazis, while raising awareness among the general public to encourage people to put further pressure on US foreign policy. But he realised his campaign was missing something: a label for this most barbarous of crimes that captured its inherent brutality and unique, destructive nature. He needed a word that would grab people’s attention and elicit an immediate, resounding moral condemnation. Using his linguistic skill and passion, he coined ‘genocide’. It combined the Greek derivative ‘genos’ (translating to ‘race’ or ‘tribe’) with the Latin derivative cide (meaning ‘killing’). Easy to pronounce, concise and effective, Lemkin saw it as the lexical solution. He defined the word as a ‘coordinated plan of different actions aiming at the destruction of essential foundations of the life of national groups, with the aim of annihilating the groups themselves’. A name for the most heinous of crimes would, however, mean nothing without the international legislation to enforce it, and Lemkin still had much work to do in this regard. Following the end of World War Two, Lemkin made his way to Nuremberg where he aimed to push his agenda of establishing genocide in law while Nazi war criminals were put on trial. He secured minor victories as the word ‘genocide’ crept into some of the official language of the cases, but no one was charged using the term – only for ‘crimes against humanity’. He embroiled himself in these pursuits, and this came at the cost of his health. He didn’t sleep, his blood pressure was high and he would occasionally faint from hunger. Leaving Nuremberg, he returned to the US to try his luck on the UN at its New York office. There he created a nuisance of himself, badgering delegates with tales of genocide in the hope that they would embrace his agenda. Despite growing ‘paler, thinner and shabbier’, Lemkin’s work finally paid off. On 11 December 1946 the UN General Assembly passed a resolution condemning genocide, while a committee was brought together to draft a treaty that would make it illegal. A New York Times editorial in the wake of the decision read: ‘From now on no government may kill off a large block of its own subjects without impunity’. Four years later, on 16 October 1950, once the General Assembly had voted unanimously to pass the law and 20 UN countries had ratified it domestically, the crime of genocide became outlawed internationally. Yet, it would not be the end of Lemkin’s battle. He would not see anyone brought to trial for the offence – it would take 50 years for someone to be convicted of genocide, a Rwandan mayor Jean-Paul Akayesu for his role in the country’s 1994 genocide. Nor would Lemkin ever see his adopted country of the United States ratify the treaty, which set a terrible standard to the international community. Traditional US attitudes towards preserving their own sovereignty lead politicians to shy away from giving it their backing, a feeling that would only exacerbate as the Cold War took its hold on international relations and McCarthyism created a climate of suspicion and fear within US borders. He committed the final years of his life haranguing politicians on the subject of genocide, desperate to find a way to achieve ratification. His health continued to deteriorate. He was destitute and becoming increasing antisocial, disappearing for days at a time from the handful of friends he had. On 28 August 1959, the year of his fifth Nobel Peace Prize nomination and at the age of 59, Lemkin fell down dead from a heart attack while in the press office of a publisher. His tireless pursuit for justice for past and future victims of genocide no doubt hastened his early death, but his legacy remains not only in the coinage of the word that defines the crime, but also in its very existence in the textbooks of law.